You talked....we listened! New larger size available. Try our BIG Tee-sers! 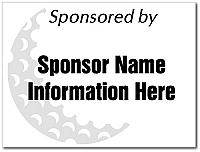 Holds 11" x 17"
18 Little Tee-sers 9" x 12" Personalized Golf Sponsor Signs with Display Stakes and FREE SHIPPING! 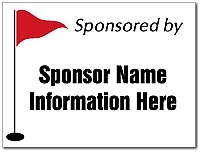 18 Little Tee-sers 9" x 12" Personalized Golf Sponsor Signs with Display Stakes and FREE SHIPPING! THE LITTLE SIGN WITH A BIG IMPACT! Little Teesers Golf Kit - Holds 8.5" x 11"
BIG Teesers Golf Kit - Holds 11" x 17"
Print out your own sponsor logos and information and save. Use these over and over. Little Tee-sers Clear Sleeve Inserts hold a standard 8.5" x 11" sheet of printer paper. Big Tee-sers Clear Sleeve Inserts hold a legal sized 11" x 17" sheet of printer paper. 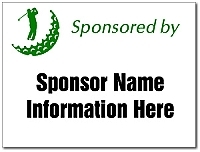 Copyright Golf Sponsor Signs. All Rights Reserved. eCommerce Software by 3dcart.